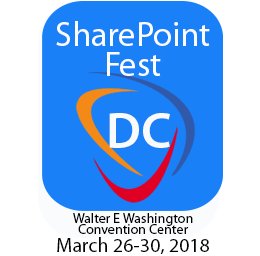 SharePoint Fest returns to Washington, DC March 26-30, 2018 at the Walter E. Washington Convention Center. Nintex, an easy, point-and-click workflow automation software, will be on the expo hall floor as a title sponsor of this annual technology conference. SharePoint Fest DC will begin with two days of pre-conference workshops on March 26 and March 27, followed by a three-day conference (including an expo hall) March 28 - 30. Be sure to stop by the Nintex booth to see how their focus has been to build software and cloud-based services that provide powerful, yet easy-to-use capabilities to automate a wide range of processes! Nintex is the recognized global leader in workflow and content automation (WCA) with more than 7,000 enterprise clients and 1,700 partners in 90 countries who have built and published millions of workflow applications. With its unmatched breadth of capability and platform support delivered by unique architectural capabilities, Nintex empowers the line of business and IT departments to quickly automate hundreds of manual processes to progress on the journey to digital transformation. Nintex Workflow Cloud™, the company’s cloud platform, connects with all content repositories, systems of record, and people to consistently fuel successful business outcomes.